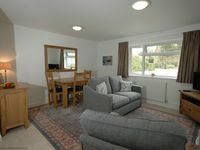 Property 3: Tranquil Cottage in this Quiet Corner of The New Forest. Property 12: Pet-friendly Holiday Cabin in secluded rural idyll near the New Forest. Property 15: The Down House Cottage less than 3 miles from the heart of historic Winchester. Property 40: Superb Lodge. 5 star resort close to South Coast beaches and New Forest. Wi-Fi. Property 43: The Potting Shed - a gorgeous, characterful bolthole in Winchester's old town. Property 47: 4 bedroom Cottage in large private garden off single track lane. Everything in the cottage was perfect. We loved the shower, the towels and the hot towel-rail!! We had a very comfortable bed and duvets of the perfect thickness for our super weather! TV selection and Internet both great. When we arrived there were lots of goodies, home made flapjack, fresh eggs, tea, butter etc - very nice as we arrived around 7:90pm! Petersfield has a nice supermarket, Waitrose, so we got all we needed for breakfast there the next morning and ate outside on our little terrace. Lots of nice pubs in and around the town, everyone needs to visit &ldquo;The Harrow&rdquo; nearby (we first knew it in 1969 - we lived nearby until 1982) - and chat to Elaine about how long the pub has been in her family!! We had a day out to Jane Austen&rsquo;s house in Chawton (near Alton) - a magical place for all who have read her books. We met former colleagues in &ldquo;The White Hart&rdquo; in South Harting....go up onto the South Downs from there, and maybe make for &ldquo;The Royal Oak&rdquo; at Hooksway!! Even from far away in Arizona, we often think of this part of beautiful Hampshire, so thank you, Paula and David, for making our visit so memorable... we hope to return. My husband and I were in England from Canada and recently spent a week at the Down Cottage while visiting family who live close by. The garden setting and the restored old home made for a unique and interesting place to stay. Because the relatively recent renovation of the house included excellent heat, light and plumbing fixtures we were warm, we could read in the evenings and we enjoyed great water pressure in the shower. Having just come off a week's walking holiday on which the walking paths were essentially mud, I was very pleased to find a working washing machine at the Cottage. Susan was a warm and welcoming host, helpful if we needed it without being at all intrusive and she communicated with me ahead of time promptly. Despite easy access to the motorway and to the trains, the Down Cottage is on a quiet road and offers a lovely, tranquil setting. Should we need a place to stay close to Winchester again, we hope that the Down Cottage will be available. It suited us perfectly.